There are several genera of birds that are notoriously hard to identify. Here in North America, beginning and experienced bird-watchers alike (ok, mostly beginner) scratch their collective heads over Sparrows, and Gulls, Shorebirds and Flycatchers. Similar plumages and overlapping ranges make it hard to pick apart certain species from some of these groups, and the field guides never seem to quite cover all the bases. 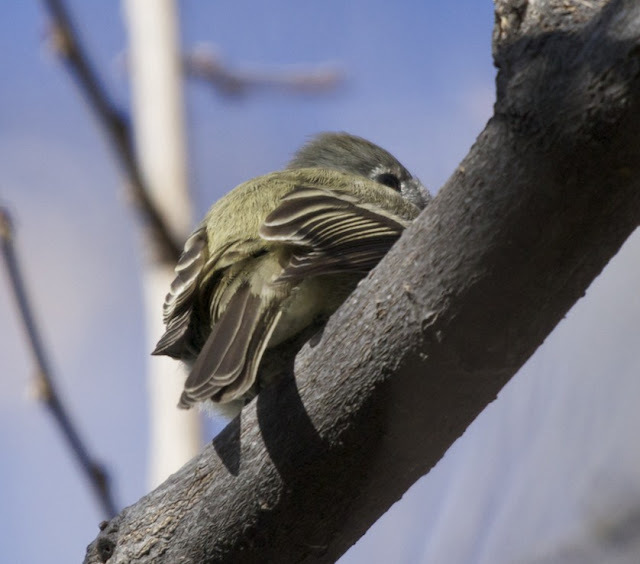 For my money, the empidonax flycatchers are some of the most difficult, and I love them for it. Small and silent...they are birds of the shadow. Sure, Gulls are tough, especially in their intermediate/immature plumages. But once they're in their adult molt they're not as tricky, at least not for those with a bit of experience (not that I have much). The same goes for most Shorebirds when they're in their breeding plumage, so at least for part of the year they can be identified without too much headache--although it is a shame so many are up in the Arctic circle during that time. Sparrows are problematic too, and are usually the first difficult group that birders have to tackle. While their plumages are subtle and similarly colored, the Sparrows can at least usually be ID'd by plumage alone. This brings me back to the empid Flycatchers...those look-alike, act-alike, conspicuous and ambiguous flighty little buggers that don't really change their ubiquitous plumages throughout the year or ever take it easy on a fledgling birder. And so, more for my own review and edification than anything else, here's an inspection of some befuddling Flycatchers. I first saw this bird in February around Patagonia Lake in southeast AZ and thought it was a Gray Flycatcher. 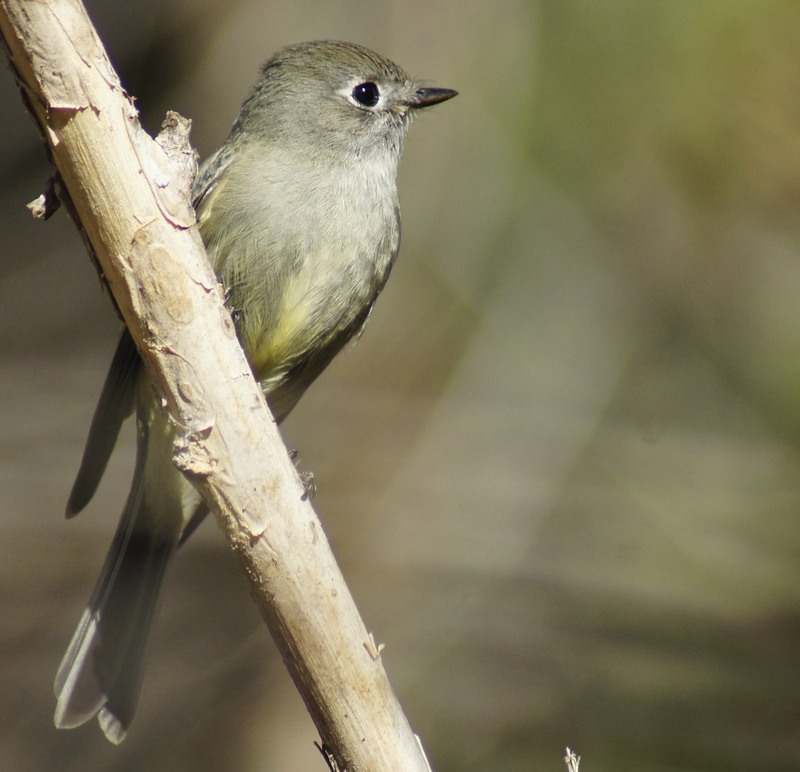 Gray's and Dusky Flycatcher's look very similar and frequent similar haunts. Grays have a slightly longer tail and the adults are a bit paler. I think I'll stick to Gray for this bird, but some nagging feeling says this could turn into a Dusky at any moment...or even something much, much more embarrassing. 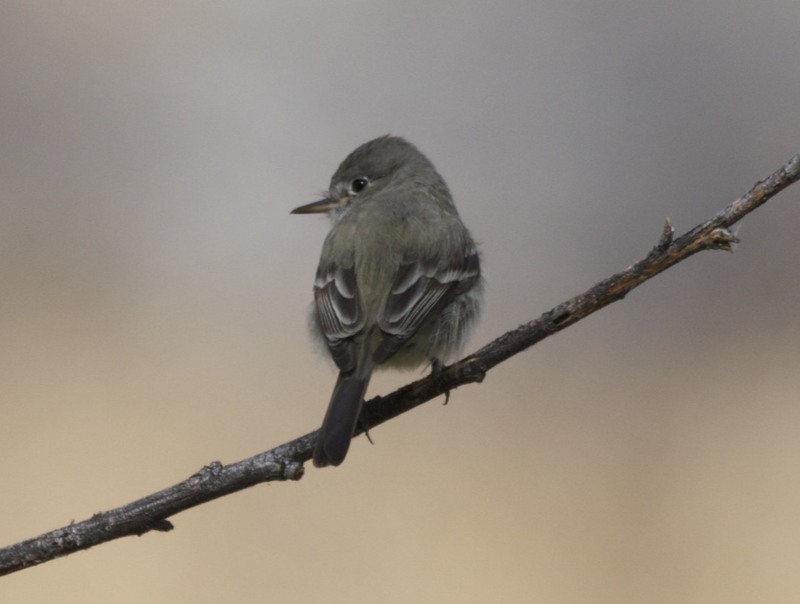 Another important clue in differentiating Gray Flycatchers from Dusky is mandible length. Provided one gets a nice profile view of the bird, which is thankfully easy with these vain little birds, the Gray Flycatcher's beak is much longer relative to its head. 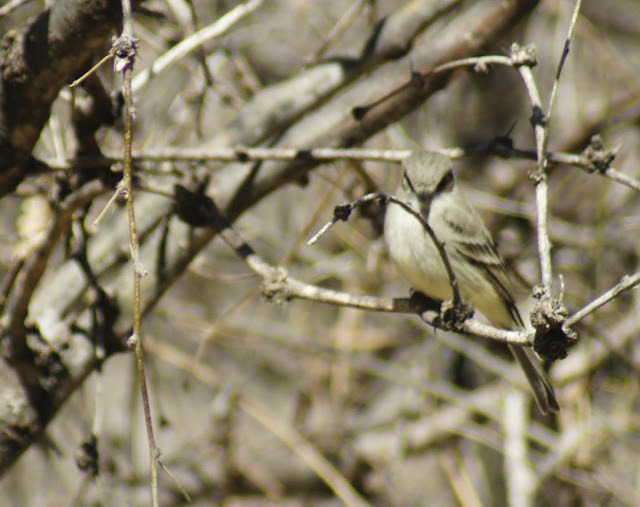 This bird, seen on the De Anza trail in southeast Arizona, was being a real stick in the mud, identification wise, until it flew lower and gave a profile picture. Notice too how the apparent yellow hues on this bird in the first picture are much more drab on the more dully-lit second. Overcast skies...they help to out an Gray Flycatcher too. 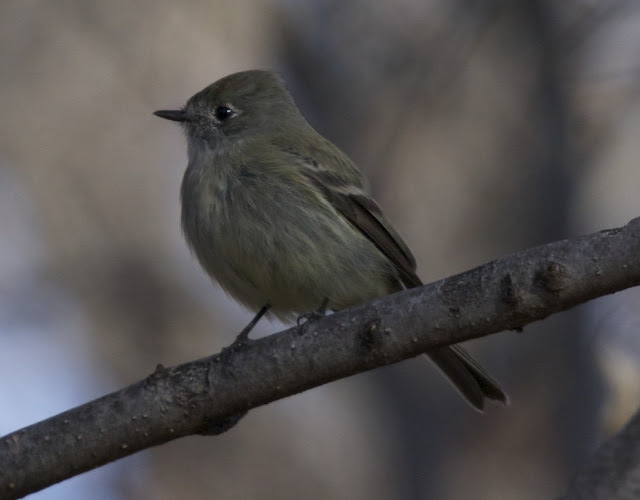 Slightly smaller than the Gray Flycatcher, which also seems to be the most common of these first three, the Dusky Flycatcher also has a short, dark bill and prefers lower, thicker brush to set up its insect ambuscades. 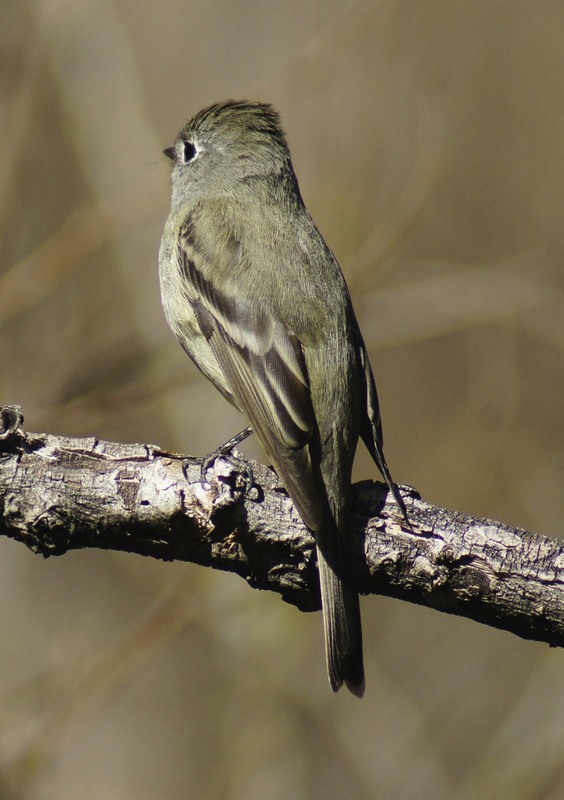 Going just by general color and demeanor, a Hammond's can turn into a Dusky or Gray Flycatcher too, but luckily they tend to prefer more coniferous perches and have noticeable longer primary projections on their wings, meaning their primary feathers protrude noticeably farther downward from their secondaries. With other empids, the wings extend to the base of the tail, but the Hammond's has a longer reach relative to its body. 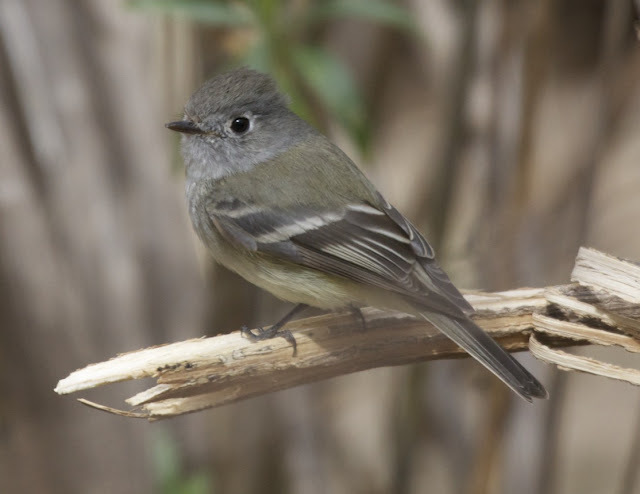 Compared to the Gray Flycatcher, it also has a stumpy beak and a more pronounced vest. Here in Phoenix, the Pacific-Slope vs. Cordilleran war rages at the Desert Botanical Gardens every summer. Both birds can pass through the area during migration, and they're physically indistinguishable if they keep quiet, which of course they do. How many Gulls or Sparrows or Shorebirds are there that are literally indiscernible from each other unless you hear them call (Probably lots more than I am aware of huh...)? 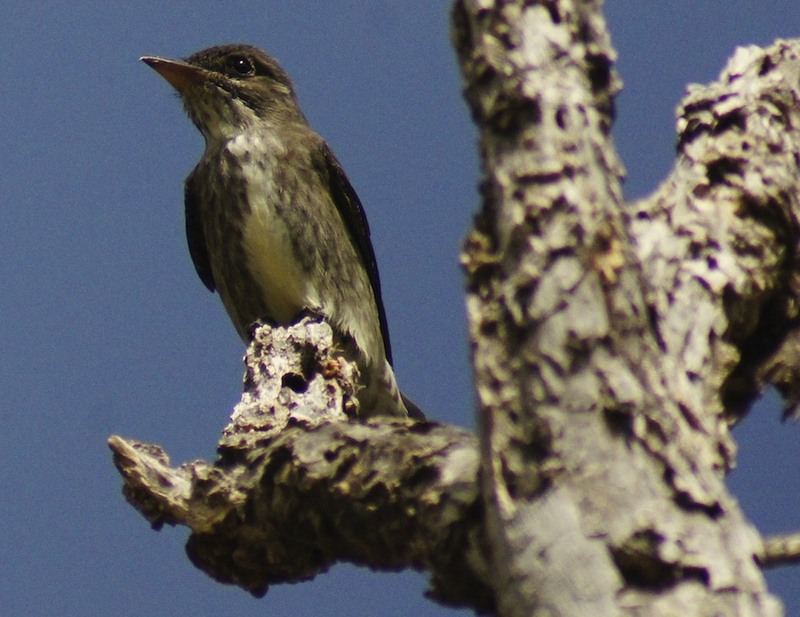 I see these Flycatchers with every later spring and summer visit to the Desert Botanical Gardens. 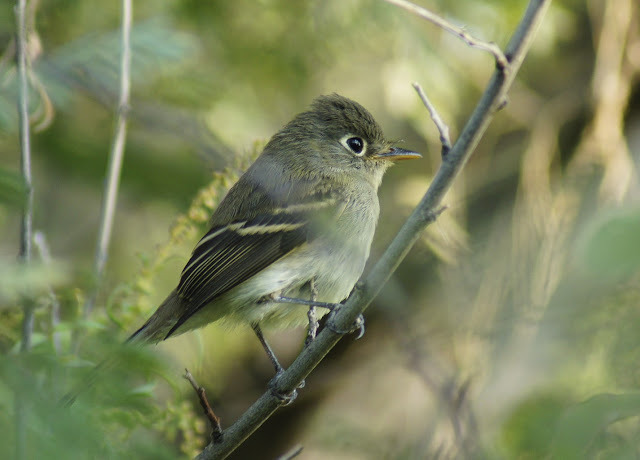 Because the Cordillerans typically stay in the higher altitudes, the general opinion among the DBG regulars is that the Flycatchers at the DBG must be Pacific-Slope. However, it's pretty far inland for Pacific Slopes too, so it still doesn't seem any more likely to me that it's one or the other based just on their normal ranges. The Sibley's field guide doesn't show either coming into the Phoenix area much, but the Cordilleran's summer range, though normally at higher altitude, is nearer by. Sibley only shows the Pacific-slopes coming through central Arizona during migration. Empids like the one below can be found at the DBG throughout the whole summer, even on the same perches, which makes me think they're not just migrating through, but are actually sticking for more than a few days. Given the options, it seems to me that the likelier bird is the Cordilleran, which at least is a summer resident in nearby parts of the state--even if I must contravene The #1 World Birder's 4th rule about trying to be a better birder. The empids mentioned so far have had a western flavor to them. Not to worry! There are plenty of hair-pulling, teeth-gnashing, fuss-strating empids out east too. Don't quit now; don't let them win; here we go! 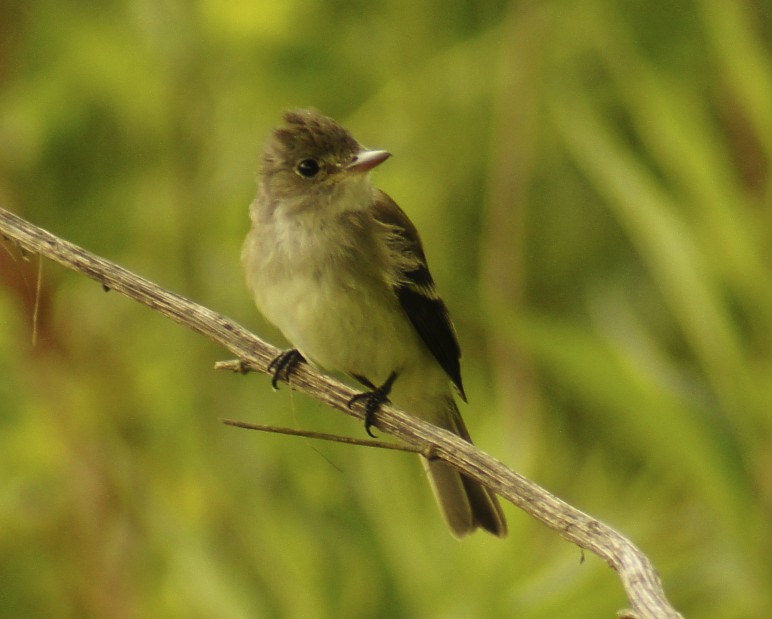 I'm wanted to call this guy an Acadian Flycatcher because it seemed too light all round to be Willow. When I photographed this bird in southeast Pennsylvania, it was within Acadian range. However, the Acadians are supposed to be high tree dwellers like the Pewees, and this fellow was working the low shrubs. 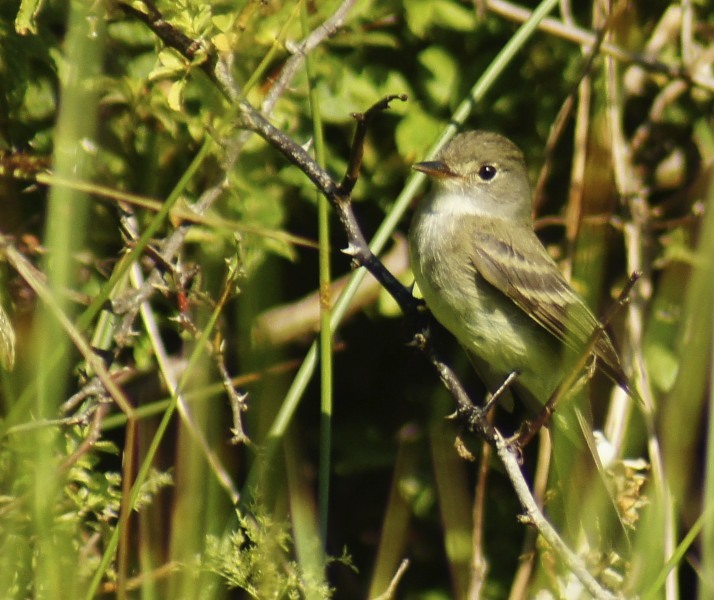 Upon further review, I thought this might be an Alder Flycatcher, but honestly its face seems too light to match any of those birds really well. It seems to lack the darker lores of both the Alder and Willow Flycatchers, which brings me back to the lighter-faced Acadian...There's always an answer, sure, but sometimes you'll just never know it. 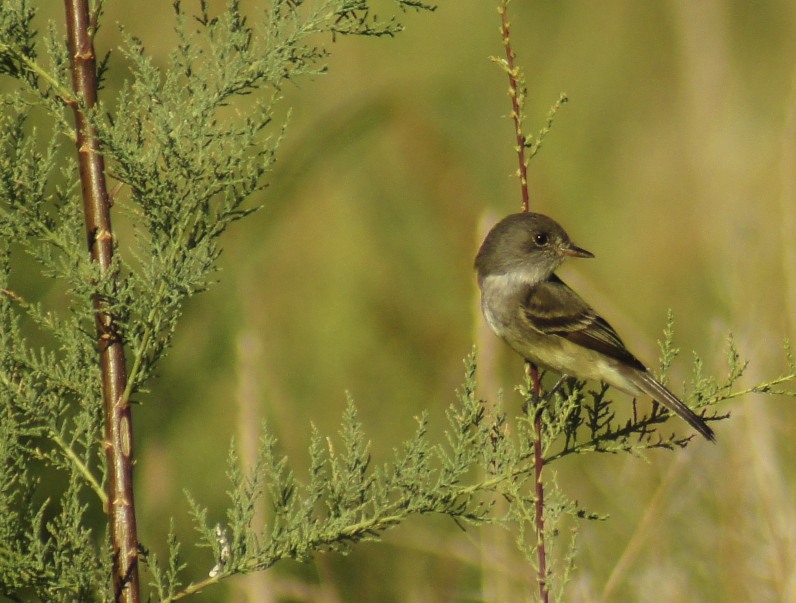 Anyway, here's a definite Willow Flycatcher. However, it's not obvious from the photo, since the beak looks too orange and the head looks too crested/peaked--in fact he looks a lot like the ambiguous bird above. But unlike the other empids featured in this post, this guy let out a mighty "RITZbew." It vocalized and so did I! Yeehaw!! Definitive ID baby! Many birders have gone half mad and half insane (which, in case you're wondering, means one is 'insad') trying to sort these guys out. In truth, it's more crazy-making than trying to contemplate the cardinality of infinite sets that can be greater or smaller than each other while simultaneously being infinite! When the empid finally calls, it is a sweet mercy. Now if only I could recognize their calls. 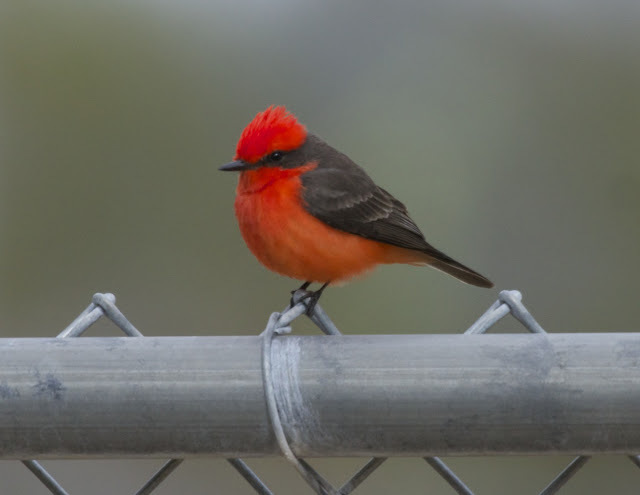 Thank heavens for the Vermilion and other Flycatchers like it, which restore my faith in the Flycatcher family and in myself. Beautiful bird photos - love that red one! Thanks Montana girl. Go forth, and fear no empid! Cheers Adam. I shudder to meet the person who does not love the resplendent Vermilion Flycatcher. They're quite magical birds - changing identities so easily. I think I will be happy if I can narrow it down to Tyrannidae. Yes, and I only touched on a couple of the sense perceptions--sight and sound--it may be more beneficial to approach empid ID from the olfactory perspective, like a true champion. How about taste? Do Vermillion Flycatchers have a bit of a spicier tang to them while Ash-throated Flycatchers a smokier flavor? I can only assume. 8 out of 10 prefer Vermilion in a blind taste test across the nation. Oh Chris, you're a glutton for punishment too then, at least punishment within the confines of taxonomy. Being driven nuts is fun, as long as you go mad with power. Going mad without power...it's boring. Nice piece! But you've been sold a bill of goods, my friend. The Empids are a conspiracy perpetuated on us all by a secret society of elite and sadistic birders. Don't believe it! THE TRUTH IS OUT THERE. BTW this is also a gift from Japan. We have made note of your protest, and will come quietly for you in the night, you know, like an Owl. Laurence, these birds drive me nuts as well. I absolutely HATE IT when I cannot identify a bird! Great post. I will consult it next time I need to identify an empid! And I have to say, that last shot of the Vermilion on the fence is just classic. I have a "ver-million" just like it! Winter is Almost Over, a Recap. Here There be Sea Dragons! Review: How Many Birds Do You Need?